Among the equipment of the colossal 134-m (440-ft) yacht, designed by Espen Oeino, with seven decks and 4,500 square meters of luxury interior space that Fincantieri has started to build in its Muggiano yard in Italy, there is a small submersible capable of plunging to 328 feet (100 m) below sea level. The identity of the Owner to whom the yacht will be delivered in the year 2010 has not leaked out but rumors say he is a Russian entrepreneur. Among the 793 billionaires all over the world, just 9% of them owns a yacht longer than 240 ft (70 m). One of these multi-millionaires is another Russian Uncle Scrooge, Roman Abramovich. His fabulous yacht Eclipse, under construction in the Amburg-based Blohm & Voss yard, will be the biggest yacht in the world measuring 548 feet (167 m) long and will include a small submarine that, according to the English designer Terence Disdale, may be used by the magnate in case he needs to secretly abandon the yacht. Actually, the submarine is a Diving Delivery Vehicle, a vessel capable of plunging to a depth of 115 feet (35 m) below sea level, where one may have a taste of the marine natural wonders. If one decides to explore them, in the literal sense of the expression, then a submarine vessel specialized in challenging the abyss is needed. It is true that Larry Elison, renowned founder of Oracle Software and great sea lover, after making himself a present with the "Rising Sun", a 420 ft (128 m) long superyacht, was then distracted by the acrobatics of a fighter jet. Instead, other Owners of sizeable fortunes started to avert the seduction of submarine "playthings" guaranteeing spectacular effects. The American Paul Allen may be considered one of the pioneers of this trend. Octopus, the 416 ft (127 m) megayacht of the co-founder of Microsoft, is fitted with a ROV - a remotely-operated vessel. At the beginning of February Allen went to the Antarctic with Bill and Melinda Gates as guests, according to rumors, on the traces of two historical wrecks of the polar exploration era: Larsen's Antarctic and Shackleton's Endurance. Yet no one could confirm whether the Octosub, the new 40-ft 10-passenger submarine, built by the Canadian International Submarine Engineering, capable of navigating underwater for several days at the depth of 1,312 feet (400 m) was onboard the yacht. 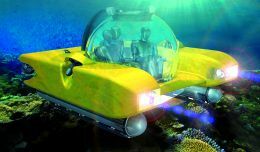 "1993 is the year in which for the first time a VIP bought a submersible," reveals Bruce Jones and adds, "The U.S. Submarines," of which he is founder and president "designs and builds deluxe vessels for long-term submarine excursions. "Orders for the year 2007 are 5 Triton 1000, a 2-passenger vessel - 9.8-ft (3 m) long times 9.8-ft (3 m) wide, weighing 6,600 lbs. (3 metric tons) - with acrylic pressure hull and a maximum speed of 2 knots" specifies the French associate Jean Claude Carme "and 4 3-passenger vessels. All of them are capable of navigating at 1000 ft (305 m) below sea level". The cost is respectively of 1.44 and 1.65 million dollars, equipment excluded. "In the next five years, we believe our models will attract 5% of the market of yachts above 98 feet that are being built every year by the world yacht industry", he proudly adds. The flagship of the US Submarines is the Phoenix 1000, an enormous vessel, 213 feet (65 m) in length, 1,500 tons of weight in air, with 5,000 square feet (460 sq m) of deluxe interior space. 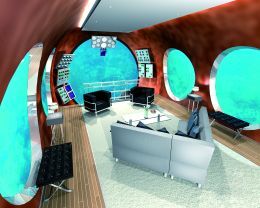 The first unit costs almost 80 million dollars and offers the thrill of diving to a depth of approximately 1,000 (300 ft) without depriving oneself of the comforts offered by yachts such as, among others: color TV, videotape player, CD player, ice-maker, microwave oven. The 12 guests accommodated in 6 cabins with en suite bathrooms may use the comfortable ample saloon and dining room of the main deck to familiarize with the unusual and fascinating underwater panorama. 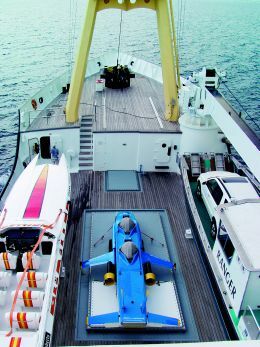 The Phoenix 1000 is designed to carry a minisub that not only extends underwater exploration to the depth of 2000 feet (610 m) but may also take back to the sea surface 2 to 8 passengers in case of need. Emotions similar to those promised by this top-notcher of the abyss, guarantees Carme, were experienced by the passengers of the first Nomad 1000 models -20 m (65 ft) long, costing 6.5 million dollars - and of the Seattle 1000 -36 m (118 ft) long, costing 25 million dollars. These two models may be delivered respectively in 20 and 36 months. Those unwilling to wait so long or to invest such sums to transform into reality the underwater adventures imagined by Jules Verne, may turn to Silvercrest Submarines. This English yard offers submersibles for any need and economic investment, included in the price is the piloting course for the ordered vessel. 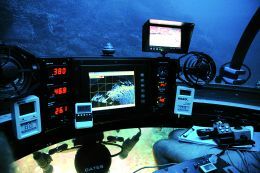 The major snag in the development of the sector of underwater leisure navigation may be the lack of prototypes, which are extremely important for the potential owner when deciding to buy a submersible. According to market surveys, the Owners of megayachts worth over 150 million dollars and divers, who are non-owners but privileged lovers of the deep abysses, are the potential buyers of such vessels. Since 2006, Undersea Hunter, a specialized diving Costa Rica-based operator, offers divers during its cruises to the Island of Cocos and the Colombian Island of Malpelo, an enthusiastic variety of dives onboard its submersible Triumph to depths between 328 ft (100 m) and 1500 ft (457 m) below sea level. At depths ranging from 800 ft (250 m) to 1200 ft (400 m) marine species, often hardly known by science, such as the Prickly Shark Echinorhinus cookei, may be seen. The Triumph is 17 ft 6 in (5.34 m) long, is capable of navigating at 2 knots, its cabin - a transparent sphere for three occupants - opens like a bivalve shell, has a normal air supply of 6 hours, individual emergency breathing devices and a reserve air supply for 3 days. The Triumph is not the only gem of the Seamagine Hydrospace Corporation. 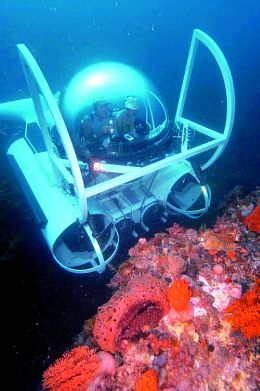 The Ocean Pearl, for example, was conceived for deep-sea leisure dives. It takes two occupants to a maximum depth of 270 feet (82 m) and may be operated from a large luxury yacht. The California-based company, specialized in building two and three occupant submersibles, has vessels currently operating in 5 countries with over 7,000 dives accumulated to date. The new attracting and futuristic formula of the underwater pleasure industry could not go unappreciated in Arab countries. Although it is difficult to find confirmation to the words of the designer Paul Moorhouse according to whom two Arab Emirates oilmen own submarines with cabins, it is to be pointed out that the Dubai-based Nakheel Corporation, owned by the Sultan Ahmed bin Sulayem bought Seahorse Marine from the Frenchman Herve Jaubert. The company, renamed Exomos, is building the prototype Proteus, a finely designed vessel for 8 passengers with a fiberglass hull, intended to sail at 25 knots on the sea surface and at 3 knots underwater - she can submerge to a depth of up to 59 feet (18 meters). Passengers may sit either outside on the seats fitted forward or inside, in non-pressurized areas. Estimated cost of the Proteus is approximately 5 million dollars. The immersion formula conceived by the San Francisco-based Hawkes Ocean Technologies is revolutionary. Its vessels do not submerge vertically as classical submarines do, but they fly toward the sea bottom as airplanes, to which they may be likened even for their shape - a fuselage fitted with small wings. The Deep Flight Super Falcon, the newly born and the most precious jewel conceived by Graham Hawkes, a world renowned specialist in submarine vessels, does original underwater acrobatics when the pilot simply moves the joy-sticks. The vessel moves away from the surface at a speed of 320 feet (98 meters) a minute and is capable of returning to the surface twice as fast, expelling ballast air contained in the ballast tanks. All Super Falcon models are in composite material, the same material used for spaceships and may accommodate 2 to 8 passengers in the acrylic dome- shaped cabins which guarantee 360-degree breathtaking views of the liquid environment. The contained cost of the Deep Flight Super Falcon - 2 million dollars for the 6 passenger fully-fitted version, 750,000 dollars for the 2-passenger one - its extreme reliability and operative range which does not require a mother ship, are the reasons for its market success. The first two training courses offered by Hawkes Ocean Technologies for 40 would-be pilots are fully-booked as well as a third one, lasting three days, taking place in the Bahamas at the cost of 15,000 dollars. The exciting futuristic age of pleasure boating already started. Jules Undersea Lodge, Key Largo Undersea Park, 51 Shoreland Drive, Key Largo, Florida 33037; Tel. 001-305-4512353; http: www.jul.com; e-mail: info@jul.com; Located 33 feet below sea level, the Lodge accommodates a maximum of 6 guests starting from US$445 per person, per night, half board. The lodge is fitted with TV, telephone and stereo. Underwater marriages may be organized. Undersea Hunters, P.O. Box 025216, Dept. 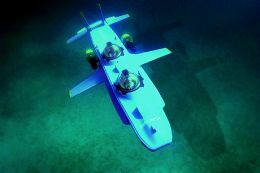 314, Miami, FL 33102-5216, USA - http: www.underseahunter.com, e-mail: info@underseahunter.com, Tel. 00-506-228-6613; Undersea Hunters, based in Costa Rica, is the first operator in the world specialized in diving trips capable of organizing underwater exploration of the underwater realm. Prices of the cruise at Cocos and Malpelo Islands, on board MV Sea Hunter - 115 ft long, accommodating 18 passengers in 6 double cabins and in 2 triple cabins - and on board MV Underseahunter - 90 feet long and accommodating 14 passengers in 7 double cabins - range from US $ 3,945 for a 10-day cruise to US$ 5,895 for a 15-day cruise. 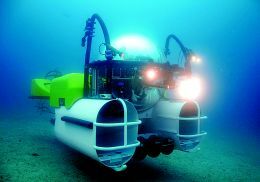 Prices do not include optional dives on the Triumph Deep Sea submarine, one pilot and two passengers, costing US$ 595, US$ 1,095, US$ 1,595 and US$ 2,495 dollars per person to dive respectively to depths of 330 ft (100 m), 700 ft (215m), 1000 ft (305 m) and 1,500 ft. (457 m).